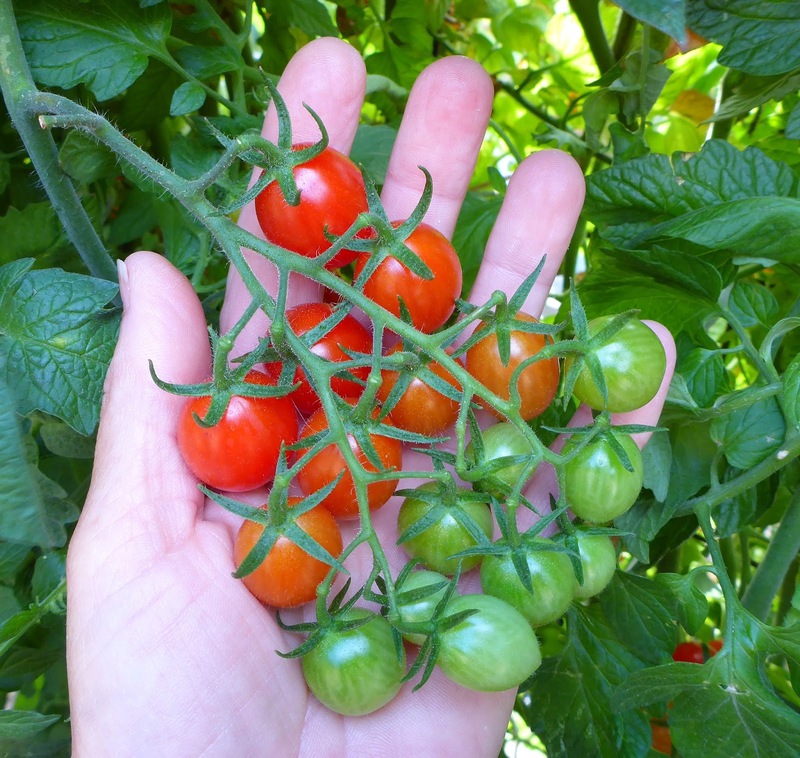 I tried five new varieties of tomatoes this year and the best of the bunch is Piccolo Dattero. The seeds for this tomato came to me from a friend whom I met on a hiking trip and who as since been reading my blog. 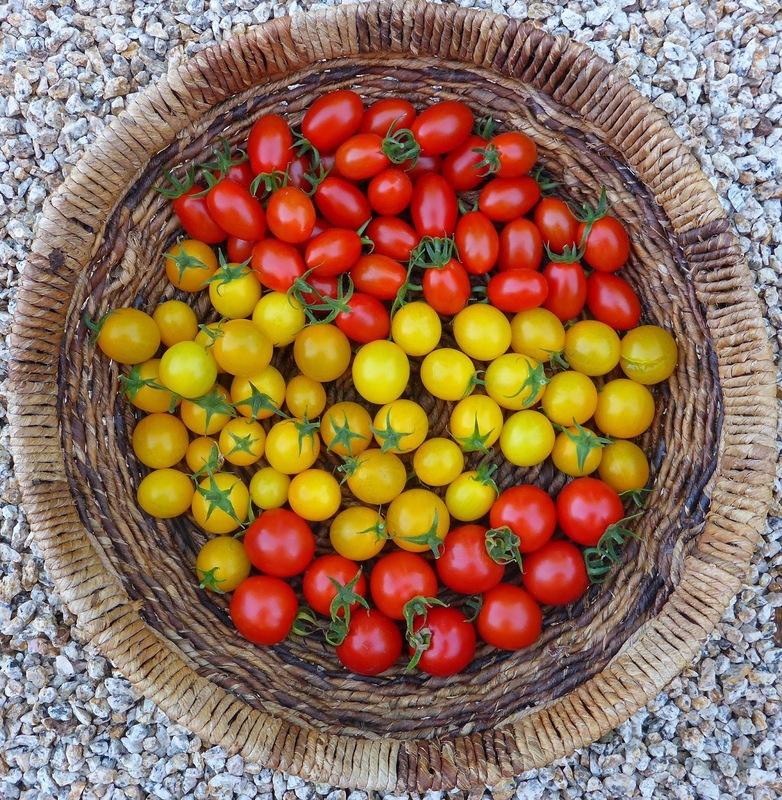 Last year she was traveling in Italy and came across a great tasting cherry tomato that she managed to get seeds for and so kindly offered me some. Of course I accepted her offer and I am so glad I did. This is one of the best cherry tomatoes I've ever grown. The name translates as "little date" and is named so because its shape resembles a small date. This type of tomato is called Pomodoro Datterini in Italy, basically "date tomato" and there's more than one variety to be found. I've also read that the tomatoes are supposed to be sweet like dates. Well, they are sweet but not as sweet as the sugary dates that I've eaten. For size comparison the basket above shows Piccolo Dattero at the top, Sweet Gold which is an average sized cherry tomato, and Camp Joy which is fairly large for a cherry tomato. The tomatoes grow in clusters that hang on the vines. Some clusters are single stemmed and can be quite long. Other clusters have 2 or 3 stems. When I harvest cherry tomatoes I pull them off the vine with the cap attached. Leaving the cap on reduces splitting significantly. I've found that when the tomato pulls off easily, detaching at the joint where the cap attaches to the main stem, that that is an indication that the tomato is fully ripe. Piccolo Dattero is one of the few cherry tomatoes I've grown that is not prone to splitting if the tomatoes are harvested without the cap, but I still use the ease of detachment as an indicator of ripeness so I harvest them with the caps on. This variety has a few positive attributes and so far I can't find anything negative about it, although some gardeners may object to it being an F1 hybrid. It is one of the most disease resistant tomatoes I grew this year, a year when foliar diseases took quite a toll on other tomato plants. It's a vigorous grower but not overly so. (One reason I don't grow Sungold anymore is because it's far too rampant). It's a generous producer but not overwhelming. But most important it tastes great. These little treats have a firm skin that is just shy of being tough. They are bite sized which means you can pop a whole tomato in your mouth, which my husband likes because it means he can safely eat them without having juice squirt on his shirt. And you do want to pop the whole thing in your mouth and bite down to get an explosion of flavor. Chomp down and there's just enough resistance to make them a bit chewy, enough flesh to give them substance, and plenty of juiciness to make them squirt with intense flavor. To my taste the have a perfect balance of sweetness and acidity. It's hard to stop eating them once you get going. When I was trying to find more information about these tomatoes I was surprised to learn that in Italy they are available peeled and canned and used as sauce tomatoes. One name they go by in the canned version is Baby Plum tomatoes. Wow, I'm not sure I would do that at home, it seems like it would be an onerous task to peel enough to fill just a quart jar. Still, I wonder how a sauce made from them would taste since they are so different from the paste tomatoes that I usually use. I don't think I'll find out this year since the plant is producing just enough to keep us happy for fresh eating. I've grown a number of small plum/pear tomatoes over the years that superficially resemble Datterini tomatoes, including Grappoli d'Inverno, Fiaschetto, Principe Borghese, and others. Those were all good tomatoes, but they didn't measure up to my favorite paste tomato (Amish Paste) for sauce and for fresh eating they weren't as good as cherry tomatoes. They did make great dried tomatoes though, however I dry enough other tomatoes to meet my needs and don't need to grow a tomato specifically for drying. If I hadn't been given the Piccolo Dattero seeds I probably would have passed them by thinking that they would be like other small plum or pear shaped tomatoes I've grown. So thank you again Sue for introducing me to Piccolo Dattero tomatoes, I will definitely be growing them again next year and probably for years to come. Now the good news for any of you who would like to try them yourself. The seeds came from Franchi Sementi and are readily available to US gardeners through Seeds From Italy (growitalian.com). Those look and sound great. Would you maybe classify them as a grape tomato because of the oblong shape? I think they are pretty unique, they aren't like grape tomatoes that I've grown before, so perhaps it's best to stick with the Italian classification of "date" tomato. This one does look like a winner. Those are big clusters of tomatoes on it too. It sounds like a great multi-use tomato, good when fresh or dried. I have several favorites I get from Seeds From Italy, so I will add this one to my list for 2017. Thanks for the writeup! I'm amazed that you might have room for one more tomato in your lineup! I hope this one is worth the space. It's unique and perhaps not to everyone's taste, but I love it. Michelle - I'm delighted the daters worked out so well for you. You can see why I had to buy some seeds after we ate the tomatoes in Italy! Sue - Thank you again for sharing the seeds, those little daters are a treat! Trying to describe to someone else the taste of a tomato is very difficult, isn't it? In any case, I know that tomatoes grown from the same seeds, but in two different places, can well turn out completely different in terms of taste and texture. For instance, many people rave about Sungold, but when I have grown it, the skins were tough and the flavour was nothing special. Just as with grapes, the "terroir" and the weather play a big part. Of course, what I would really like is to eat Italian tomatoes in Italy! You are so right, both about describing flavors and the effects of terroir. Brandywine is a much vaunted tomato in the US but it doesn't develop that flavor in my microclimate. I'm often hesitant to try something that is clearly adapted to a warmer climate, like Sicilian tomatoes, but some varieties are adaptable to different climates and it seems that Piccolo Dattero is one of them. I'm sure it's going to taste quite different grown in a warmer climate, but not necessarily better. I'm so glad I found your blog, since I can't seem to find any good information on this variety. When you say the plant is a "vigorous grower but not overly so", approx. how many feet tall would you say this got? Is it very bushy and hard to contain in a cage or more along the lines of a few main vines? You're right, there isn't much information about this tomato, at least in English. It is an indeterminate vine with many shoots. It grew easily to the top of the 5 foot tall trellis that I trained it on and kept going. I did quite a bit of trimming to remove side shoots when the plant was young but at the end of the season I pretty much let it go and it kept putting out side shoots but didn't overwhelm the neighboring plants. I think it would not be difficult to keep it contained within a large cage. Thanks so much for responding! Very helpful information.